Communication Book approaches the subject of communication through integrative theory, research, and hands-on methods. A threefold approach identifies important communicative concepts: choices in interpersonal situations, the theories and research that support these choices, and the communication skills necessary to effectively use these theories. The text allows readers to examine the question of how, when, and through which channels they should communicate in different contexts. The Fourteenth Edition provides the newest insights and research in person-to-person interaction, making for an up-to-date source for communication study. New features and chapter-by-chapter updates make Interpersonal Communication the most comprehensive, relevant source on the topic. Also available with MyCommunicationLab MyCommunicationLab for the Interpersonal Communication course extends learning online, engaging students and improving results. Media resources with assignments bring concepts to life, and offer students opportunities to practice applying what they’ve learned. And MediaShare offers an easy, mobile way for students and instructors to interact and engage with speeches, visual aids, group projects, and other files. Please note: this version of MyCommunicationLab does not include an eText. 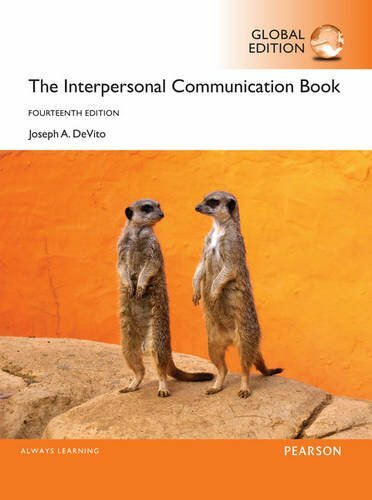 The Interpersonal Communication Book, Fourteenth Edition is also available via REVEL™, an immersive learning experience designed for the way today's students read, think, and learn. Learn more.